It’s that time again! Time to take a look back at the month and get to the nitty gritty of the business side of things. That’s right, there IS a business side of things. It’s not all instant pot recipes and freezer fudge. Sometimes as much as I wish it was! 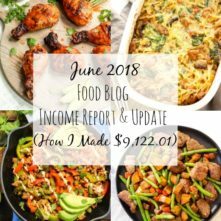 If you’ve been following along, I started posting these income reports as a way to share honestly with you about my growth.. and the struggles and successes along the way. Most of you know I didn’t mean to be a food blogger. I didn’t grow up thinking this would ever be my “job”, and I didn’t start my instagram, or my blog with this in mind. but here we are. And, honestly, I couldn’t be happier or more in love with what I get to do. It didn’t come all that easy, though. I hope through these reports you can get a better sense of what life is like on the other side of the photos and recipes here. If you’ve never read an income report before, read more about why I’m doing them. The short of it is that before I started this blog, other blogger’s monthly reports were so helpful for me when I was figuring all of this out for myself. And I’ve wanted to do it since the first month this blog started, the month I made $0.27, as a personal blog diary about all I’m changing, growing and learning along the way. However, I didn’t start these income reports back when I wanted to. Someone told me, “people are just going to your blog for food, they don’t care about that”. So I didn’t. And now, even though I never started my blog with the thought of making money (I didn’t even know how people did it), I regret it not doing it anyway. Word of advice, do what you want with your blog, regardless of what other people think you should or shouldn’t be doing. I really hope the information in this post gives you a little insight and motivation if you’re new to this whole blog thing. And check out my post on how to start a blog for a step-by-step of how I did it if you’re interested in giving it a go too! If you’re worried about being a little fish in a big massive blogger pond, don’t be. That was my biggest hang up but if I’ve learned one thing, it’s that there’s room for EVERYONE to succeed and do well. The opportunity is yours if you want it enough! Since January when I went full time, I’ve had basically zero off button. Zero work-life balance. Zero chill.. and about 23534 growing pains. All the sudden my blog was bigger than what I had ever anticipated and requiring so much from me. And, only me. I’ve known for a while, like you’ll read in last month’s report, that I’ve been aware I’ve been overwhelmed. My attention was needing to go every which way and I was juggling ALL THE BALLS in the air at once. At first, I thought it would be fine and I could “hustle harder” and #girlboss my way through it. And I did. For a while. And I mean I was staying up all night long (literally, did not not sleep, which is so unhealthy) almost weekly at least one night. Working from 7am to 2am the others just trying to keep my head above water. Constantly trying to keep up with projects, emails, updates, deadlines, content approvals, edits, back end work, calls, recipes, writing, my clients, social media, contracts, laundry, you name it. This system, I thought, was working. Until it wasn’t. I was sitting at my desk so many hours for a solid 3 months straight that I ended up getting cubital tunnel syndrome. So, for those of you who think you can outsmart your body, or that being your own boss is super duper glamours, I have news for you. It’s not always. Granted, I still love it so, so much. But, It’s okay to not be able to do it all. I learned that the hard way last month when I lost feeling in my ring and pinky finger. LITERALLY FROM WORKING SO MUCH. It’s not cool, and it’s not admirable. It was my wake up call that I needed to get some help. That, and the second I started dropping the balls that I thought I could juggle on my own, I knew some of my business mentors were right. Probably time to get some help and the job/business side of it had become too big for just me. So, big news this month! You’ll see in my expenses that I hired an employee! Woo! If you would have told me this would happen a year after this blog started, I would have bet you everything I owned that you were wrong. I started this blog as an extension of my Instagram, and then it was just a nice tiny side income to help with my debt and student loan monthly payment. I never ever would have guessed this would happen. Or, more accurately, that I would have loved it as much as I do to MAKE it happen. But here we are and I couldn’t be MORE in love with my job, or more excited to wake up to do it each day. Now, I have someone else on board with me and it makes it that much more fun. It’s letting me get back to the actual creating and writing and cooking that is what I signed up for to begin with. Nothing will change here for you and the content I create. It’s good news for you, because I’m able to do more of it, and do it better. We’ve been using Coschedule for the last few months, which I am obsessed with because I’ve been trying to put systems in place to automate and make my life easier. I’ve been using a makeshift content calendar for a while with excel, but coshedule blows that one out of the water. I’m able to edit or write posts, plan them out, schedule both blog and social posts all from Coschedule. I can drag and drop posts to different dates if I don’t like the way they’re organized. It tracks how well your social campaigns do. It allows you to loop them and therefore reduces the overall work. It’s freaking amazing. Better yet, my “team” (yes, I can say that now and I’m excited about it even if it’s just me and another person), have color coded projects and tasks so we can each see what we’re responsible for, and the days they need to be done by. We can write notes to each other in Coschedule and stick them right in the calendar. We can communicate and do our own work independently but always be on the same page. I’m getting more efficient with my time each day now and I LOVE IT. Well worth the investment to see the balls I was dropping not be dropped anymore. Here’s what our content calendar looked like a few days ago when I took the screen shot. Beautiful huh? So now that the cat’s out of the bag, here’s the numbers from last month! Income is counted as what I have physically received in the month of April, not for the work I did. Typically sponsored posts don’t pay out for 30 days, affiliates don’t pay out for 30-60 days, and ad networks don’t pay out for 60-90 days. Meaning, I won’t physically have the money from April until next month or later. Income I don’t consider blog income or add to my income report is my coaching business. 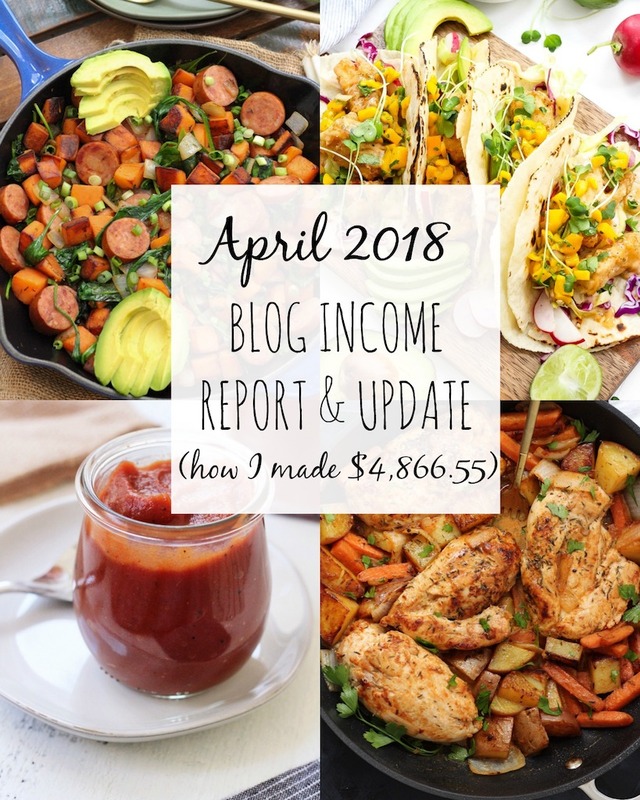 I probably could consider it blog income, but truthfully, it takes up so much of my time – time that isn’t spent on blog work, so I think of that as a different revenue source. Some sponsored work I did that should have paid out this month is late getting into my actual bank account, which although sometimes frustrating, I’ve learned is the nature of the business I’m now in. Now it’ll be reported on May’s income report, even though the work was done in February. It was a big adjustment to go from having a set paycheck I knew would show up, to relying on companies, their accountants, and their systems. While the standard terms are usually always net30, that money could show up in 5 days after I’ve sent the invoice, or be a week past day 30. The ad revenue for the month of April was payment that correlated to page views from two months ago as well. This is also a bit of a trade-off. You have to wait for it, but now I can know exactly how much I’ll receive in the coming months. So, for example, I already know what I’ll be making next month, and in June, and July based on the page views from the last 3 months. On that note, I’ve been so stinking happy since switching to Mediavine. My revenue has increased each and every month, and by mid-summer, my ad revenue will be over 30% more than what my monthly salary at my job was. 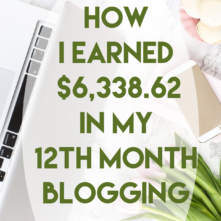 This is such a weight off my shoulders, and my boyfriend’s, because it’s giving us a sense of security when just a few months ago when I decided to just GO FOR IT, our financial situation with my blogging was up in the air every. single. month. Yes! Like I mentioned earlier in this post, there’s room for everyone. I’m still SO NEW at this compared to a lot of people and even I’M telling you, go for it! I’m more than happy to help you, too! I have a really detailed step-by-step guide to setting up a blog, and a growing list of blog resources that I use on my own blog. If you need any further help, don’t hesitate to ask me in the comments! ‘Til next month! And, as always, thank you for your support. I wouldn’t be living my dreams if it wasn’t for you! I have been waiting for this. I have read all of your income reports and they are truly inspiring. I starting reading your posts because I work full-time and recently started my food blog. I have read other persons income reports and they are great as well, but what makes you stand out is that you get down to the nitty gritty and that’s what I need. It’s encouragement that it will not always be sunshine and roses, but it can be done, even while working a “9-5”. Keep it up! So happy for you! Thank you so much – I truly appreciate this! I love talking about blogging so I always want to make sure the info I provide is of value 🙂 And yes, you CAN do it!! 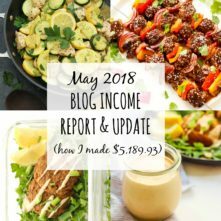 These income reports are so inspiring! Amazing what you have accomplished so far. Such an inspiring income report. I have a question, how did you find the right person to hire? Thank you! And that’s a great question. I kind of lucked out there because Janelle is my best friend of 10+ years who thinks creatively, was willing to learn, and knew my brand/website already. She happened to have some time to take on additional work! So while I had to train her on all of the backend stuff and general processes, it would either be that time investment with someone I already have a great relationship with and knows me, or someone who didn’t know me at all but already knew the VA stuff!